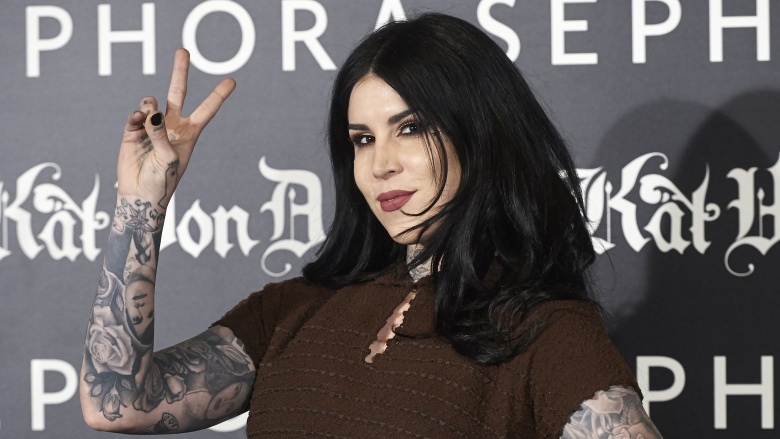 Tattoo artist and entrepreneur Kat Von D took to social media in July 2016 to publicly demolish her longtime friendship with makeup artist and fashion designer Jeffree Star. Since then, Star has fired back with an attack of his own on YouTube. What did they say, and what exactly caused all this drama in the first place? We've put together a timeline for you that lays it all on the line. The opening shots were not fired by Von D or Star, but by Stephanie Nicole, a beauty blogger and YouTube celebrity known for her detailed and brutally honest product reviews. In June 2016, she uploaded a 43 minutes long review of Star's latest product lines, but deviated from her review at about the 19-minute mark when she began addressing the controversy that surrounds Star. In particular, she brought up his history of bad interactions with fans and even racist remarks he's made. Just when we thought the fallout from Nicole's video was starting to die down, Von D posted a picture of Star on her Instagram feed, explaining that she was was no longer able to "hold her tongue" after recent events. Von D apparently felt responsible for some of the controversy Star has caused because she introduced him to many of her connections and fans, including the lab who got Star his makeup line deal. She apologized to anyone who may have been caught in his crossfire over the years. She then went on to say that she was going to "disassociate myself from him and his brand from this point on" and that yes, she would also be "pulling the shade 'Jeffree' from my collection." As the drama over her Instagram post reached a fever pitch, Von D utilized YouTube to post a 14-minute follow-up video, explaining the reasons behind her decision to cut ties with Star. In it, she gives an emotional explanation, detailing how Star was no longer the person she used to know and has become a fame-hungry "monster." In particular, she called him out for bullying fans and people he disagrees with, and also for trash-talking small cosmetic brands about labeling errors while he opportunistically goes after the vegan and cruelty-free market, despite not being vegan himself. The majority of the video, however, is dedicated to Star's alleged non-payment of an artist friend of Von D: designer B.J. Betts. 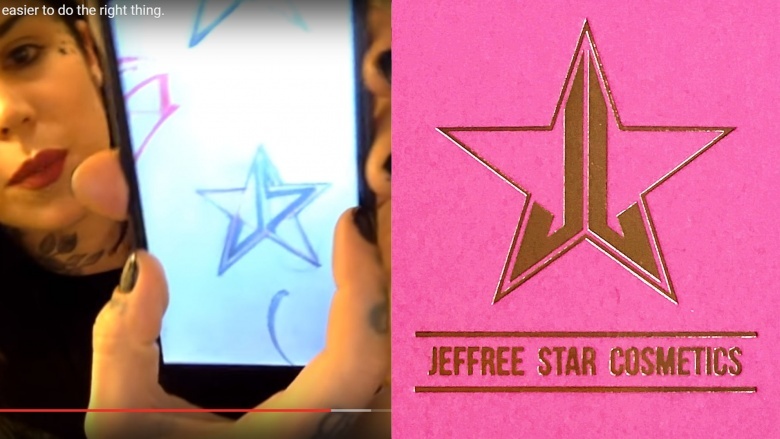 Von D claims she introduced Betts to Star and that Betts designed several preliminary logo ideas for him, at which point Star cut off contact with Betts and refused to pay him for his work. The photo above shows the concept art from Von D's video alongside Star's current packaging from his cosmetic line. Did he rip off the logo from Betts? You be the judge. While Betts has stayed fairly mum on the issue, Star claimed in a tweet (which he later edited) that another designer, and not Betts, designed his logo. Thankfully, nothing on the internet ever gets truly erased, and a quick-thinking Twitter user managed to take a screenshot of Star's original tweet, which included the Twitter handle of the other designer. This other designer in question responded to the controversy by clarifying that his role in the design process was only to vectorize—convert to digital form—a logo from concept drawings that Star brought to him. Let the Twitter war begin! At this point, the social media firefight really got underway in earnest, with Von D and Star trading jabs on Snapchat and Twitter. Star quickly uploaded a Snapchat reaction video, claiming that Von D's video was "lies and propaganda," and that there were "two sides to every story." Star also tweeted a screenshot of text messages with Von D, in which he tells her that he didn't use Betts for the artwork and suggests she "stay the f*** out of my business." A day after Von D's video, Star replied in kind with a YouTube video of his own. He claims that while the artwork on his packaging wasn't Betts', the designer did get the idea started for him. Star also says that at the time he couldn't afford Betts' artwork, and so he ended up going with another designer who had previously designed items for Star's clothing line. Star goes on to say that Betts has now been fully paid for his participation in the design process. Starr also claimed Von D trash-talked him to the owner of Too Faced cosmetics, and he made a point to dredge up her previous struggles with drug and alcohol abuse. Finally, he alleged Von D had malicious reasons for stirring up this controversy, and that while he doesn't know what Von D is going through at the moment, he still "wishes her all the best." The matter between myself and Jeffree Star has been amicably resolved and I will have no further comments on the matter. At the time of this writing, Von D has also declined to respond further to the controversy, except to let Betts know she was glad he finally got compensated for his hard work. As for Star, he has since turned his attention to other things, like the launch of his new liquid lipstick collection. After the release of Von D's video, his YouTube subscriber count plummeted below 2 million within hours, but since the situation has been resolved, that number has been steadily climbing, and has topped 2 million again. "Another chapter closed," he tweeted. "I have a huge launch for my brand and this won't be ruining it. Love you all. We guess the old saying is true—any publicity is good publicity!